We appreciate all of the efforts the Canadian Forces goes through. – this is our thank you. Please visit us for your service and parts needs. 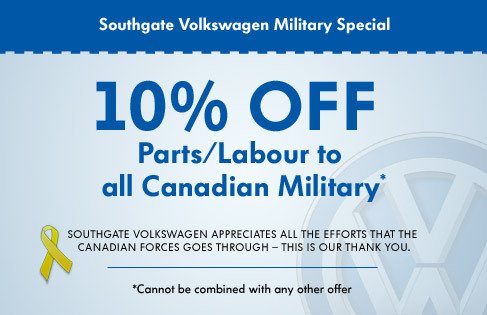 We are pleased to offer you a 10% discount during each service visit at Southgate VW. 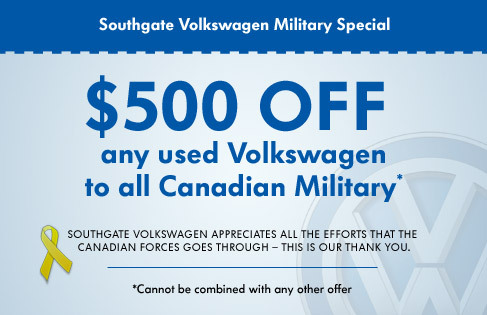 In addition, if you are in the market for a used Volkswagen, we will also offer you a $500 discount towards any used Volkswagen from Southgate Volkswagen. Please view out list of Certified Pre-Owned Used Volkswagens to find one you like or Contact Sales.